Rhode Island began allowing the state’s three medical marijuana dispensaries to sell cannabis to out-of-state MMJ patients this month. But it’s “far too early” to assess what impact sales to out-of-state-residents will have on Rhode Island’s cannabis supply or retail receipts, Chris Reilly, a spokesman for the Thomas C. Slater Compassion Center in Providence, told Marijuana Business Daily. Businesses may not see a boon because that isn’t the intent of the law, the Providence Journal reported. Rather, the goal is for visiting patients “to lawfully obtain medical marijuana so they (don’t) have to illegally traffic it in or obtain it in (the state’s) black market,” Norman Birenbaum, the principal policy and economic analyst for the state’s MMJ program, told the newspaper. The state’s three dispensaries reported to the Journal that they’ve sold cannabis to approximately 112 nonresidents since the new regulation went into effect. Dispensaries must use “reasonable good-faith efforts” to verify nonresident medical marijuana ID cards by asking for a second form of government-issued photo ID. Nonresident patients must be entered in a state database that tracks sales. Nonresident patients are limited to how much cannabis they can buy – 2.5 ounces of marijuana or its equivalent in other forms every 15 days. 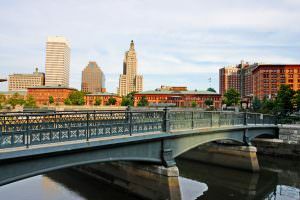 The regulation allowing out-of-state MMJ patients to buy cannabis in Rhode Island was included in the state’s 2019 budget. But Gov. Gina Raimondo’s proposal to add 12 more MMJ dispensaries was nixed from the budget, and the state’s General Assembly voted to increase the annual cost of a dispensary license from $5,000 to $250,000.